There are many ways to volunteer at Ross Mill Farm… and everyone of them is important and crucial to our success. We would not be where we are today if it wasn’t for the generous, giving people that share their time and love of animals with us. If you would like to volunteer with us, or have any additional questions after reading the following, please call us at 215-322-1539. 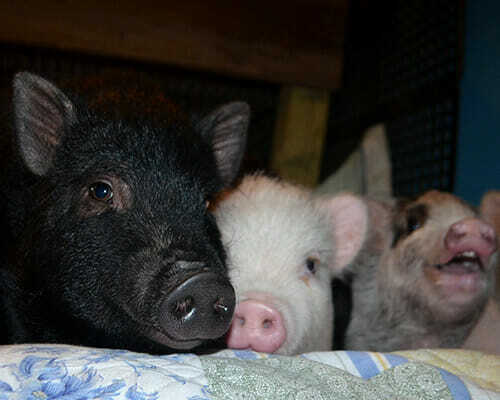 We are always in need of people to volunteer at the farm… be it in the Lodge, where washing pig bowls and dishes, doing a load of laundry so the pigs have clean bedding, and wiping down the pens and floors will definitely keep you busy… but not too busy that you can’t spend a little time giving out belly rubs to our Lodge residents. 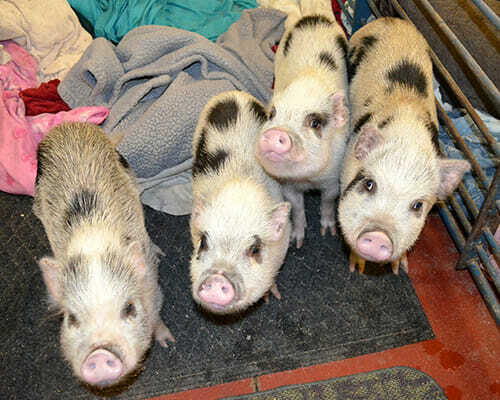 We also need outside volunteers… helping with maintaining the outdoor pig pens, which can include fence repair, winterizing the pig houses in late Autumn, and tidying up the pig yards. When you arrive, you will check in at the Lodge, which is the large, green-roofed building at the back of the property. 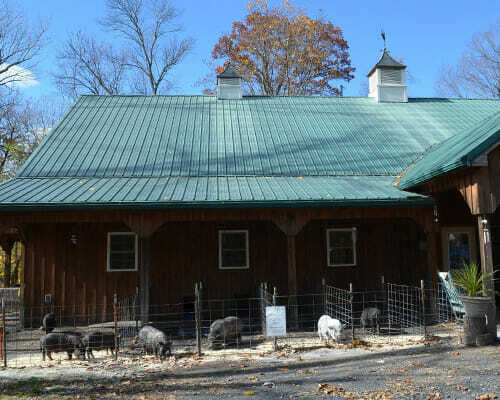 One of the staff will have you sign in and will go over what your duties will be, answer any questions you may have, and go over some guidelines of interacting with the pigs. 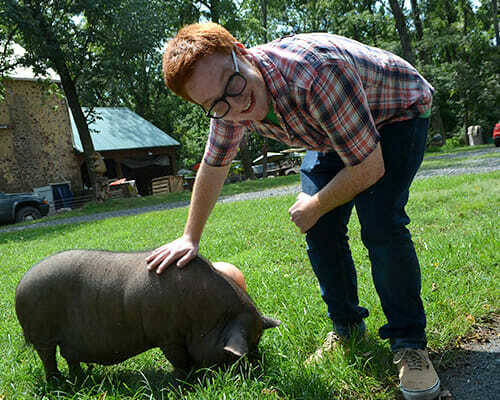 We want to make your experience volunteering at Ross Mill Farm the best it can be! Volunteers must be at least 18 years of age. We do accept children 10 and older volunteering with their parents, as long as there is a one-parent to one-child ratio. Sneakers or hiking boots are the best shoes to wear when working around pigs. For your own safety, please do not wear any open-toed shoes. If you have a group that would like to volunteer (for example: a college group, a church group, or a Scout troop, etc…), we would love to have you at the farm. Please call us at 215-322-1539 to arrange the best time to schedule your volunteer time. 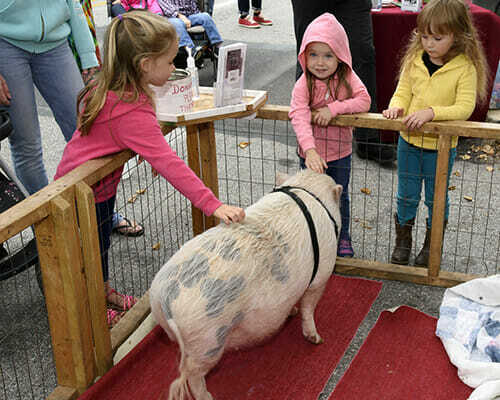 Pig Placement Network, our 501c-3 non-profit organization, often attends events in the local area, spreading the word about potbellied pigs and teaching the general public about what it is like to have a pig as a pet. 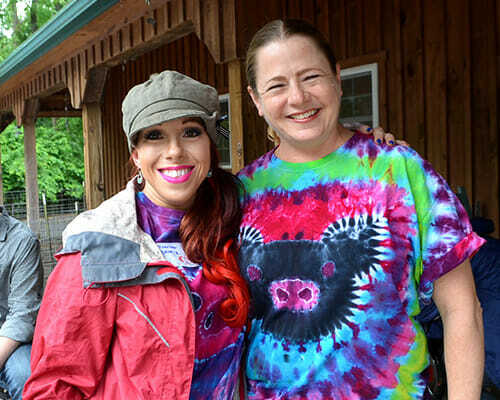 Sheryl Rotondi, the Event Coordinator for PPN, is always in need of volunteers to help out at these events, doing such tasks as setting up the booth, talking to people about pigs, selling our tee shirts or merchandise, and helping the pigs with the Pig Painting exhibitions.